This caricature comes from page 250 of Punch from 26 November 1881. It is, quite possibly, the most intricate visual caricature of all. 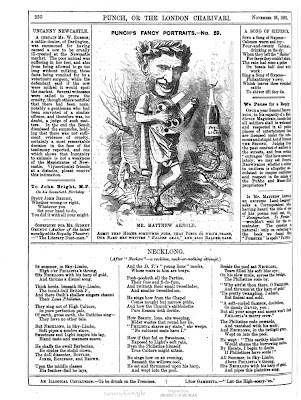 The text accompanying this caricature references the 1881 publication of Poems: New Edition, in which were reprinted many of Arnold’s early poems, including “Balder Dead” and “The Neckan.” The text reads: “Admit that Homer sometimes nods, that Poets do write trash, / Our Bard has written ‘Balder dead,’ and also Balder-dash.” “Balder Dead” was begun in 1853, first published in 1855, again in 1869, and then regularly after. The only exception is that it was excluded from Selections. A clue to the poor reception could come through the many inventions and alterations that Arnold made in and to the story of Balder, taken from the Edda which Arnold most certainly found through Mallet’s Northern Antiquities. C.B. Tinker and H.F. Lowry, in the notes to “Balder Dead” found in The Poetry of Matthew Arnold, take time to catalogue the many differences between the Norse story and Arnold’s rendering of it. Their judgment about the effect is as follows: “Arnold’s Scandanavia is certainly not the Norseland that Carlyle had praised in 1840 in his ‘The Hero as Divinity.’ The rough, homely, awkward ‘Hyper-Brobdingnagian business’ of the North is toned down by Arnold – assisted, of course, by Homer and Virgil – into something that at times comes very near to what Carlyle termed ‘the light gracefulness of the old Greek Paganism.’ […] Arnold selects from his sources – alters and invents – to stress, above all else, a Virgilian tenderness and a Virgilian pathos” (91, 92). Having been composed in the last few weeks of 1853, the preface for the 1853 volume of Poems was not far from Arnold’s mind, and so an emphasis on Greek and Virgilian style makes sense. However, the epigram in the caption references not only “Balder Dead,” but also Balder-dash, and the latter half of the epigram is reflected in another caricature just underneath the picture. 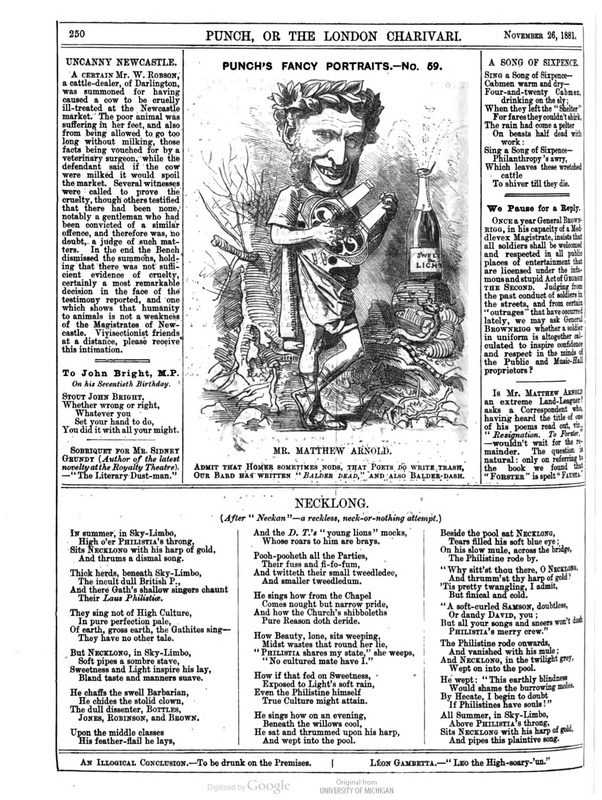 It is a poem titled “Necklong,” with the parenthetical comment, “After ‘Neckan’ – a reckless, neck-or-nothing attempt.” The poem parodies Arnold’s “The Neckan,” published first in 1853 and continually thereafter. “The Neckan” immediately preceded “The Forsaken Merman” in the 1853 and is probably meant to be a companion piece to the latter, although the poetics of the former are of inferior quality. The word “neckan” does not exist in the English language, and is a vulgarization (on Arnold’s part) of any number of terms for water devils or water spirits that populate Norse, Celtic, and British mythology (in England the term “Nicker” or “Nick” is more often used). Perhaps, though, the most noticeable element of this caricature is just how unflattering the artist’s rendering of Arnold is. The visual image opens itself up to at least three readings. The first is that Arnold is presented almost as a Bacchanalian character. He is dressed in a toga, plays a lyre, and is crowned with leaves. The presence, on the right side of the cartoon, of the Sweetness and Light champagne bottle adds to an easy equation of Arnold with Bacchus. The dead tree in the background, as well as the presence of what appears to be a pile of trash or rubble, on top of which the champagne bottle sits, is an echo of a common criticism of Arnold – essentially, that he is turning his critical eye away from the deplorable condition of the world in favor of some phantom poetic solution to society’s ills. The second chapter of Culture and Anarchy, published in 1869, shows Arnold’s awareness of this criticism: “[T]he editor of the Morning Star, taunts me, as its promulgator, with living out of the world and knowing nothing of life and men. The great austere toiler, the editor of the Daily Telegraph, upbraids me, - but kindly, and more in sorrow than in anger, - for trifling with aesthetics and poetical fancies, while he himself, in that arsenal of his in Fleet Street, is bearing the burden and heat of the day. An intelligent American newspaper, the Nation, says that it is very easy to sit in one’s study and find fault with the course of modern society, but the thing is to propose practical improvements for it. While, finally, Mr. Frederic Harrison […] at last gets moved to an almost stern moral impatience, to behold, as he says, ‘Death, sin, cruelty stalk among us, filling their maws with innocence and youth,’ and me, in the midst of the general tribulation, handing out my pouncet-box” (The Complete Prose Works of Matthew Arnold V.115-116). 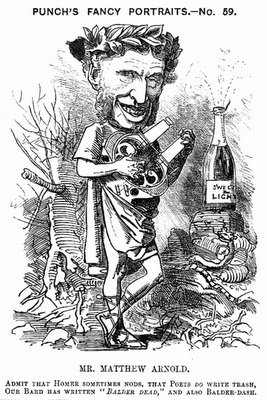 More likely, though, and considering the poem that follows this caricature, the artist is rendering Matthew Arnold as the Neckan of his own poem (the NECKLONG of the poem spoof). Similar to the exploration presented above, the Neck-Long sits apart from the movement of life, “Philistia’s throng,” weeping over it and playing a “dismal song.” The poet associates Arnold/Necklong with “Sky-Limbo,” removed from any association with earthly (read “practical”) concerns, while Philistia concerns itself only with gross and earthly matters (although Philistia is presented in the poetic spoof as much happier than Necklong, who is weeping throughout the poem; near the poem’s end, the Philistine has a “merry crew”). The poem references several of Arnold’s frequent targets in his prose, including Dissenters, the character (from Friendship’s Garland) Bottles, the Daily Telegraph young reporters, and current theology. I have heard at least one scholar mention that Arnold was, occasionally, the subject of Anti-Semitic rhetoric stemming from a belief that he was of Jewish heritage in his line. I cannot help but see, in this caricature, certain features of Arnold face, especially, that seem to capitalize on this assumption (see, for instance, Nicholas Murray's comment on page 5 of A Life of Matthew Arnold; a later, contemporary line from the Annual Register which stated, in response to a new portrait of Arnold, that it was "markedly Semetic in aspect" [qtd. Murray 302]; and, finally, a line from a letter commenting on his "Jewish cast of face" [Letters V. 341]). This, of course, makes for a conflation of images – the Greek and the Semitic - which in its own turn references Arnold's frequent invocation of the terms Hellenic and Hebraic. Joep Leerssen, in "Englishness, Ethnicity, and Matthew Arnold" (European Journal of English Studies 10.1 [April 2006]: 63-79) has adequately shown that Arnold's frequent references to cultures and/or races are not meant to be racial conclusions, but are rather metaphorical "tags": "such ethnic, or national, labels are metaphorical predicates rather than taxonomic categories [demonstrating] that we are here dealing in commonplaces and tropes rather than literal ethnology or 'national psychology'" (74). Arnold makes no mention of this caricature – any of its elements – in any of his letters.